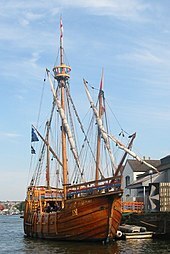 The Matthew, replica navis Ioannis Cabotti, per secundam navigationem ad Mundum Novum adhibitae. Imperium Britannicum dominiones, colonias, protectoratus, mandata, et alia territoria temperata vel administrata a Britanniarum Regno comprehendit. A coloniis transmarinis et locis commercii a Regno Angliae saeculis sexto decimo exeunte et septimo decimo ineunte institutis exortum est. Id summa gloria fuit maximum imperium in historia notum, et plus quam singulum saeculum fuit prima potestas globalis. Usque ad 1922, plus quam 458 milliones hominum in suam dicionem redegerat, quintam partem numeri civium orbis terrarum eodem tempore. Imperium plus quam 33 700 000 chiliometrorum quadratorum contexit, paene quartam partem terrestris Telluris areae. Evenit ut suum legatum civile, legitimum, linguisticum, culturale longe lateque diffusum esset. quia eius coniectus trans orbem terrarum postulavit ut sol semper in saltem unum ex eius multis territoriis fulgeret. Hodie multae civitates ab Imperio Britannico olim rectae sunt partes Consortionis Populorum. Tabula coloniarum Britannicarum in America Septentrionali, ca. 1763–1776. Servi Africani in Virginia saeculo septimo decimo laborant. Tabula ab artifice ignoto picta, 1670. Clades navium ignearum Francicarum apud Quebecum anno 1759. Rhodesia sub nomine Zimbabuae anno 1980, Novae Ebudae sub nomine Vanuatus eodem anno, Hondurae Britannicae sub nomine Belizae anno insequenti in civitates liberas erectae sunt. Quo facto imperium Britannicum fere omne in Consortionem Populorum autonomorum conversa est; id quod remanet ad congeriem insularum et regionum minimorum reducitur quae sub appellatione Territoriorum Britannicorum Transmarinorum comprehenduntur et ad eas insulas, Britanniae vicinas, ipso monarcha (neque parlamento) tributarias et nomine Provinciarum Coronae Britannicae nuncupatas. E territoriis transmarinis Insulas Falklandienses anno 1982 Argentina conquirere temptavit, iam diu ab imperio Hispanico revendicatas, et per aliquot menses tenuitm sed classis Britannica (prima ministra Margarita Thatcher) obsessores repulsit. Constitutio civitatis Canadae, usque adhuc sub auctoritate Parlamenti Britannici retenta, anno 1982 "patriata est" taliterque anno 1986 constitutiones Australiae et Novae Zelandiae. ↑ Ferguson, Niall (2004). Empire, The rise and demise of the British world order and the lessons for global power. Basic Books. ISBN 0465023282 . ↑ Brown, pp. 594, 689. Victoria Roberti Clive in Proelio Palasiensi Societatem instituit ut potestas militaris et commercialis. Deditio Cornwallis ad Yorktown. Damnum coloniarum Americanarum finem Primi Imperii Britannici significavit. Tabula Imperii Britannici anno 1897. Abernethy, David. 2000. The Dynamics of Global Dominance, European Overseas Empires 1415–1980. Yale University Press. ISBN 0300093144. Andrews, Kenneth. 1984. Trade, Plunder and Settlement: Maritime Enterprise and the Genesis of the British Empire, 1480–1630. ISBN 052127698-5. Bandyopādhyāẏa, Śekhara. 2004. From Plassey to Partition: A History of Modern India. Orient Longman. ISBN 8125025960. Brendon, Piers.2007. The Decline and Fall of the British Empire, 1781–1997. Novi Eboraci. ISBN 0224062220. Brown, Judith. 1998. The Twentieth Century. Oxford History of the British Empire, 4. Oxford University Press. ISBN 0199246793. Buckner, Phillip. 2008. Canada and the British Empire. Oxford University Press. ISBN 9780199271641. Burk, Kathleen. 2008. Old World, New World: Great Britain and America from the Beginning. Atlantic Monthly Press. ISBN 0871139715. Canny, Nicholas. 1998. The Origins of Empire. Oxford History of the British Empire, 1. Oxford University Press. ISBN 0199246769. Clegg, Peter. 2005. 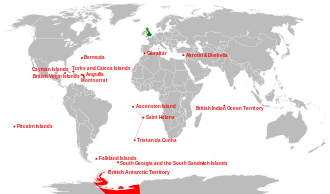 The UK Caribbean Overseas Territories. In Extended Statehood in the Caribbean, ed. Lammert de Jong et Dirk Kruijt. Rozenberg Publishers. ISBN 9051706863. Combs, Jerald A. 2008. The History of American Foreign Policy: From 1895. M. E. Sharpe. ISBN 9780765620569. Dalziel, Nigel. 2006. The Penguin Historical Atlas of the British Empire. Penguin. ISBN 0141018445. David, Sau. 2003. 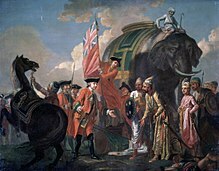 The Indian Mutiny. Penguin. ISBN 0670911372. Elkins, Caroline. 2005. Imperial Reckoning: The Untold Story of Britain's Gulag in Kenya. Owl Books. ISBN 0805080015. Ferguson, Niall. 2004. Colossus: The Price of America's Empire. Penguin. ISBN 1594200130. Ferguson, Niall. 2004. Empire. Basic Books. ISBN 0465023290. Fieldhouse, David Kenneth. 1999. The West and the Third World: Trade, Colonialism, Dependence, and Development. Blackwell Publishing. ISBN 0631194398. Fox, Gregory H. 2008. Humanitarian Occupation. Cambridge University Press. ISBN 9780521856003. Games, Alison. 2002. The British Atlantic world, 1500–1800. Edd. David Armitage et Michael J. Braddick. Londinii: Palgrave Macmillan. ISBN 0333963415. Gilbert, Martin. 2005. Churchill and America. Novi Eboraci: Simon and Schuster. ISBN 0743291220. Goldstein, Erik. 1994. The Washington Conference, 1921–22: Naval Rivalry, East Asian Stability and the Road to Pearl Harbor. Routledge. ISBN 0714645591. Goodlad, Graham David. 2000. British Foreign and Imperial Policy, 1865–1919. Psychology Press. ISBN 0415203384. Herbst, Jeffrey Ira. 2000. States and Power in Africa: Comparative Lessons in Authority and Control. Princeton University Press. ISBN 0691010285. Hinks, Peter, ed. 2007. Encyclopedia of Antislavery and Abolition. Greenwood Publishing Group. ISBN 9780313331435. Hodge, Carl Cavanagh. 2007. Encyclopedia of the Age of Imperialism, 1800–1914. Greenwood Publishing Group. ISBN 0313334048. Hogg, Richard. 2008. A History of the English Language. Cambridge University Press. ISBN 9780521662277. Hopkirk, Peter. 2002. The Great Game: The Struggle for Empire in Central Asia. Kodansha International. ISBN 4770017030. Hollowell, Jonathan. 1992. Britain Since 1945. Blackwell Publishing. ISBN 0631209689. House of Commons Foreign Affairs Committee. 2008. Overseas Territories. HC Paper 147-II. The Stationery Office. ISBN 0215521501. Hyam, Ronald. 2002. Britain's Imperial Century, 1815–1914: A Study of Empire and Expansion. Palgrave Macmillan. ISBN 9780713430899. James, Lawrence. 2001. The Rise and Fall of the British Empire. Abacus. ISBN 9780312169855. Janin, Hunt. 1999. The India–China Opium Trade in the Nineteenth Century. McFarland. ISBN 0786407158. Joseph, William A. 2010. Politics in China. Oxford University Press. ISBN 9780195335309. Keay, John. 1991. The Honourable Company. Londinii: Macmillan. Kelley, Ninette, et Michael Trebilcock. 2010. The Making of the Mosaic. Ed. 2a. University of Toronto Press. ISBN 9780802095367. Kenny, Kevin. 2006. Ireland and the British Empire. Oxford University Press. ISBN 0199251843. Knight, Franklin W., et Colin A. Palmer. 1989. The Modern Caribbean. University of North Carolina Press. ISBN 0807818259. Latimer, Jon. 2007. War with America. Cantabrigiae Massachusettae: Harvard University Press. ISBN 0674025849. Lee, Stephen J. 1996. Aspects of British Political History, 1815–1914. Routledge. ISBN 0415090067. Levine, Philippa. 2007. The British Empire: Sunrise to Sunset. Pearson Education Limited. ISBN 9780582472815. Lloyd, Trevor Owen. 1996. The British Empire 1558–1995. Oxford University Press. ISBN 0198731345. Louis, William Roger. 2006. Ends of British Imperialism: The Scramble for Empire, Suez and Decolonization. I. B. Tauris. ISBN 1845113470. Macaulay, Thomas. 1848. The History of England from the Accession of James the Second. Penguin. ISBN 0140431330. Macdonald, Barrie. 1994. Britain. In Tides of History: The Pacific Islands in the Twentieth Century, ed. K. R. Howe, Robert C. Kiste, et Brij V. Lal. University of Hawaii Press. ISBN 0824815971. McIntyre, W. Donald. 1977. The Commonwealth of Nations. University of Minnesota Press. ISBN 0816607923. McLean, Iain. 2001. Rational Choice and British Politics: An Analysis of Rhetoric and Manipulation from Peel to Blair. Oxford University Press. ISBN 0198295294. Maddison, Angus. 2001. The World Economy: A Millennial Perspective. Organisation for Economic Co-Operation and Development. ISBN 9264186549. Magee, John. 1974. Northern Ireland: Crisis and Conflict. Taylor & Francis. Magnusson, Magnus. 2003. Scotland: The Story of a Nation. Grove Press. ISBN 0802139329. Marshall, P. J. 1996. The Cambridge Illustrated History of the British Empire. Cambridge University Press. ISBN 0521002540. Marshall, P. J. 1998. The Eighteenth Century. Oxford History of the British Empire, 2. Oxford University Press. ISBN 0199246777. Martin, Laura C. 2007. Tea: The Drink that Changed the World. Tuttle Publishing. ISBN 0804837244. Mein Smith, Philppa. 2005. A Concise History of New Zealand. Cambridge University Press. ISBN 0521542286. Mulligan, Martin, et Stuart Hill. 2001. Ecological Pioneers. Cambridge University Press. ISBN 0521811031. Pagden, Anthony. 2003. Peoples and Empires: A Short History of European Migration, Exploration, and Conquest, from Greece to the Present. Modern Library. ISBN 0812967615. Parsons, Timothy H. 1999. 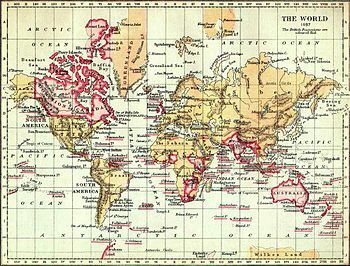 The British Imperial Century, 1815–1914: A World History Perspective. Rowman & Littlefield. ISBN 0847688259. Payson O'Brien, Phillips. 2004. The Anglo–Japanese Alliance, 1902–1922. Routledge. ISBN 0415326117. Peters, Nonja. 2006. The Dutch Down Under, 1606–2006. University of Western Australia Press. Porter, Andrew. 1998. The Nineteenth Century. Oxford History of the British Empire, 3. Oxford University Press. ISBN 0199246785. Rhodes, R. A. W., John Wanna, et Patrick Weller. 2009. Comparing Westminster. Oxford University Press. ISBN 9780199563494. Rothermund, Dietmar. 2006. The Routledge Companion to Decolonization. Routledge. ISBN 0415356326. Royle, Trevor. 2000. Crimea: The Great Crimean War, 1854–1856. Palgrave Macmillan. ISBN 1403964165. Shennan, J. H. 1995. International Relations in Europe, 1689–1789. Routledge. ISBN 041507780X. Smith, Simon. 1998. British Imperialism 1750–1970. Cantabrigiae: Cambridge University Press. ISBN 9783125806405. Springhall, John. 2001. Decolonization since 1945: The Collapse of European Overseas Empires. Palgrave. ISBN 0333746007. Taylor, Alan. 2001. American Colonies: The Settling of North America. Penguin. ISBN 0142002100. Thatcher, Margaret. 1993. The Downing Street Years. Harper Collins. ISBN 0060170565. Thomas, Hugh. 1997. The Slave Trade: The History of The Atlantic Slave Trade. Picador, Phoenix/Orion. ISBN 0753820560. Tilby, A. Wyatt. 2009. India 1600–1828. BiblioLife. ISBN 9781113142900. Torkildsen, George. 2005. Leisure and Recreation Management. Routledge. ISBN 9780415309950. Turpin, Colin, et Adam Tomkins. 2007. British Government and the Constitution. Ed. 6a. Cambridge University Press. ISBN 9780521690294. Vandervort, Bruce. 1998. Wars of Imperial Conquest in Africa, 1830–1914. Londinii: University College London Press. ISBN 1857284860. Zolberg, Aristide R. 2006. A Nation by Design: Immigration Policy in the Fashioning of America. Russell Sage. ISBN 0674022181. Vicimedia Communia plura habent quae ad Territoria transmarina Britannica spectant (British overseas territories, British Empire). Novissima mutatio die 1 Aprilis 2017 hora 17:26 facta.